Fritz the Cat is a comic book fictional character created by Robert Crumb. The character first appeared in printed form during the height of the underground comics movement of the 1960s. 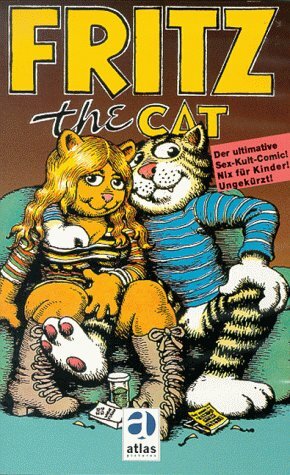 Fritz the Cat was the first character Crumb created. In the liner notes for the Fritz the Cat film soundtrack, Thomas Albright describes Fritz as "a kind of updated Felix with overtones of Charlie Chaplin, Candide and Don Quixote." Fritz was originally created as part of a series of comic books that R. Crumb and his brother Charles drew when they were kids. In the earliest stages of the character's form, Fritz was just a normal house-cat named Fred. "Fritz," as the character became, later developed into a more humanesque character as Crumb grew up, and finally into the character's final form as the tomcat we all know and love during Crumb's teen-age years. Crumb occasionally injected elements of his own biography and sexual misadventures into the strips. The character's first published story appeared in Help! #22 (January 1965). The story was called Fritz Comes on Strong. In it, Fritz brings a young girl home, and strips all of her clothes off before getting on top of her to pick fleas off her. While Harvey Kurtzman agreed to publish the comic, he told Crumb that he didn't know how he was going to "publish it without getting arrested." Fritz the Cat's adventures were published in magazines and comic books such as Cavalier, Fug, and The People's Comics throughout the years. He acquired his own title in 1969. Fritz the Cat is a 1972 animated film written and directed by Ralph Bakshi. Based on the comic books by Robert Crumb, the film was the first animated feature film to receive an X rating in the United States. Shlock producer Steve Krantz saw potential in Bakshi's vision for animated films specifically for adults. Having sold Krantz the production and distribution for what was to become the 1973 Bakshi feature, Heavy Traffic, Krantz told Bakshi to make a film adapted from another author's work before moving on to his original work. Bakshi agreed, and the two searched for the perfect project, eventually settling on Robert Crumb's anthropomorphic 1960s comic book Fritz the Cat, a character Crumb partially based on himself. Crumb saw the film as a perfect opportunity to immortalize his name in film history, and agreed to give Bakshi and Krantz the film rights to the character, thinking that the film would be promoted as "an R. Crumb film." Unfortunately for Crumb, this was not to be the case. Bakshi took to adapting Robert Crumb's comics the way he did to writing his own screenplays. Bakshi injected the film with various satiric points that had not been in the original comics the film was based on, made the sexual scenes more graphic, and added a heavy dose of violence that would soon become a trademark for Bakshi's later films.